If you don’t accept online donations, you’re missing out on potential donors that want to connect with you. GrassRoot doesn’t replace but rather supplements and enhances your current fundraising process. Bring in new sources of funds and reduce your costs by moving online. Best of all, all donations go straight to your account. Donors can pay with their credit card or eCheck (ACH) by entering just the few details and they’ll never have to leave your site to give. PayPal is the leader in online payments with one of the lowest rates in the industry. Pay with credit cards, debit cards, and bank transfers. Tax receipts are emailed to donors automatically, saving you time and money. You can even customize which projects are tax-deductible and select the payment methods that send tax receipts. Why get just one donation page? Create targeted funding pages for as many projects as you want. A project can be a ministry, a missionary, a vision trip, or anything you want to raise funds for. Give admin rights so a group of users can manage their own project page. Donors can easily setup of recurring donations and get notified every time money is withdrawn. Admins can customize giving levels and create as many items per project as needed. 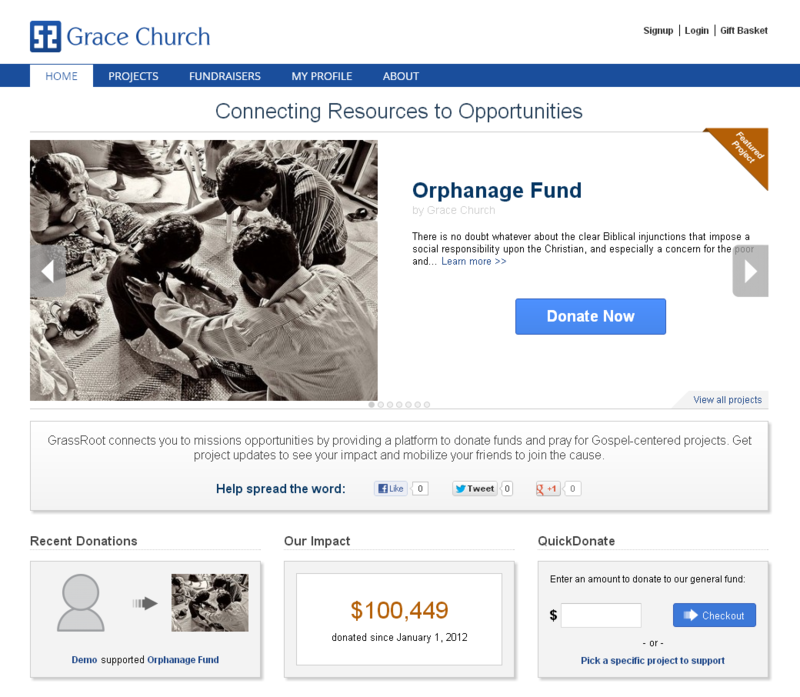 Donors can visually see the progress of projects. Admins can view detailed reports, customize with filters, and download them to Excel. GrassRoot is a cloud-based platform so there’s nothing to install or maintain. You get all the benefits without the hassle of managing software. You’ll always get the latest version with new features updated regularly. For quick access, donors can register and login with Facebook. Creating user profiles is seamless.